Here’s an interesting new initiative to promote tourism to Puglia and provide valuable services to travelers. The municipality of San Giovanni Rotondo, home to the Shrine of Saint Pio, and telecommunications company Telecom Italia have formed a partnership to provide digital tools to help visitors navigate the town and take advantage of its tourist-related services. The Shrine of Saint Pio attracts hundreds of thousands of pilgrims and other visitors every year from throughout Italy and around the world. It will be very interesting to see how this project is put to use by visitors as well as townspeople and whether it can serve as a model for other heavily trafficked visitor destinations in Puglia. My previous post was the first installment of my SWOT (strengths-weaknesses-opportunities-threats) Analysis of Puglia as a sustainable tourism destination. I began my discussion of Puglia’s tourism strengths by citing the diversity of the region’s cultural heritage. 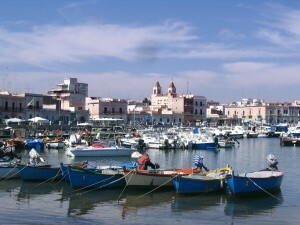 Coincidentally, the NBC News website today features an Associated Press article titled “Puglia: Italy’s Heel Has It All,” with a subtitle that says “Region offers plenty of pleasures ‒ without hordes of tourists.” The article’s focus is to describe the (you guessed it) diversity of the region’s cultural heritage. 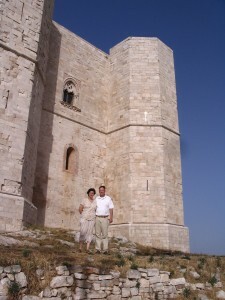 The writer, Giovanna Dell’Orto, begins by saying, “Puglia has some of the brightest seas, most diverse art and architecture, most mouthwatering peasant cuisine and kindest people in all of Italy ‒ including strangers who will go out of their way to lead you to one after another stunning beach on impossibly lapis-lazuli waters. Puglia is the heel to Italy’s boot, and after two weeks spent touring the region, I felt grateful that charter airlines don’t disgorge hordes of tourists here.” I couldn’t agree more. “Puglia is sitting on gold.” So said a university professor in Puglia to a class of tourism students, citing the region’s potential for developing sustainable tourism based on its cultural, historical, artistic and archaeological heritage. I think the professor was right, and a discussion of Puglia’s strengths as a viable destination continues my “SWOT” (strengths, weaknesses, opportunities and threats) Analysis. As I noted in a recent post, Puglia’s tourism industry is looking to U.S. travelers to help boost arrivals in the region “shoulder” tourism seasons of spring and fall, so that will be my focus here. First up: Cultural diversity. Many tourism destinations offer popular places such as beaches and markets. Many are home to interesting cultural attractions such as art, historic sites, archaeological museums and religious shrines. Many destinations offer visitors a chance to sample excellent local cuisines. What makes Puglia special is that the region has ALL of these. Beaches? Puglia has some of the best “Blue Flag” beaches in the world. Markets? Any of the bigger cities and towns has scores of shops catering to every taste – think of Via Sparano, the main pedestrian shopping street in the new section of Bari. Art? You’ll find everything from thousand-year-old frescoes to modern art in Puglia. Historic sites? Too many to name, but just consider that Hannibal defeated a Roman legion at Cannae in Puglia. 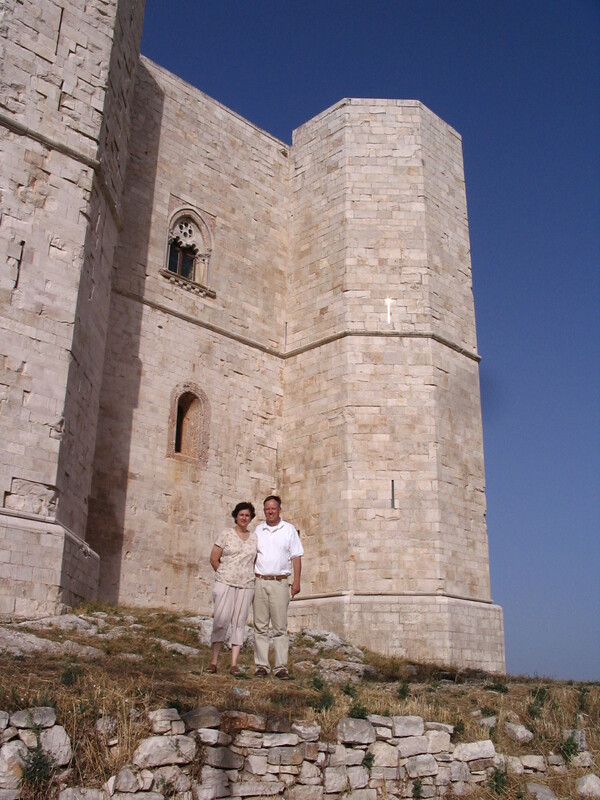 Or consider the castles built throughout the region by Frederick II, such as Castel del Monte (that’s us in the photo). Archaeology? Puglia was home to dinosaurs and cave dwellers, and you can see those sites today (learn about the 150,000-year-old “Altamura Man” at the Museo Nazionale Archeologico di Altamura ‒ the National Archaeological Museum of Altamura ‒ and while you’re there sample the bread of Altamura, which some chefs regard as the best bred in the world). Religious shrines? 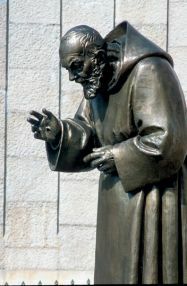 Puglia’s shrines to Saint Pio in San Giovanni Rotondo and St. Michael the Archangel in Monte Sant’Angelo draw pilgrims and other travelers from around the world, but just about any town in Puglia has a shrine or relics of a patron saint. Food? Puglia is home to the “Mediterranean Diet” known around the world for its healthy-eating qualities. This is a very generalized overview of Puglia’s cultural diversity, a key strength of the region as an international tourism destination. Go online, search for Puglia and any area of interest to you, and you’ll be pleasantly surprised by what you find. 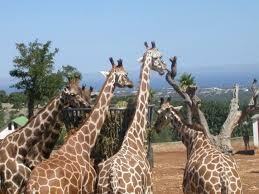 Talks between officials in Puglia and representatives of a Chinese firm that was interested in buying the Zoosafari safari park and theme park have broken off, reports La Gazzetta del Mezzogiorno. I posted an item last week about the proposed sale of the park located outside Fasano, a town in the Province of Brindisi, to the Shanghai-based National Investment Company. Apparently, however, any sale was contingent on two conditions being met: the jobs of local workers would be protected and no animals would be moved. While the Chinese firm reportedly agreed to the conditions informally, it would not guarantee them in writing. There was talk that had the sale been completed, a number of the park’s employees, some with many years of experience, would be fired and replaced by workers from other countries, and that some of the park’s animals would be sold. For now, it’s status quo. You are currently browsing the Puglia Connection Blog blog archives for October, 2013.